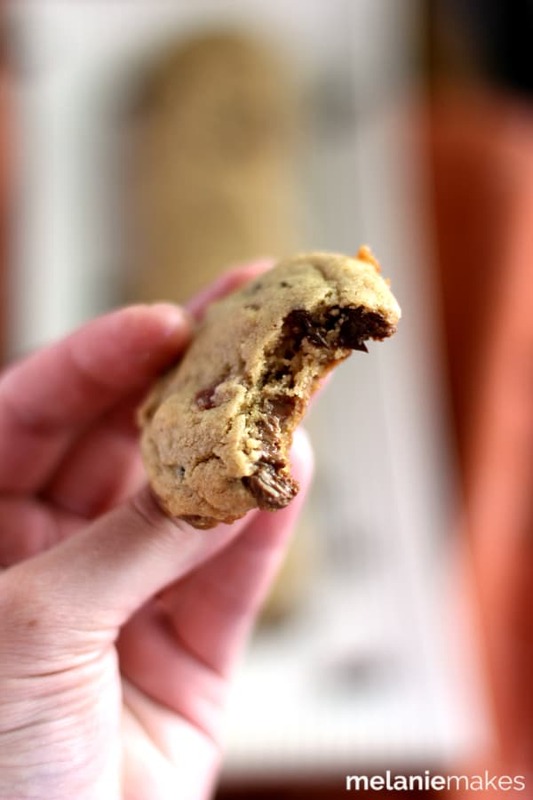 These soft and chewy Double Peanut Butter Bacon Chocolate Chip Cookies are absolutely loaded with flavor. 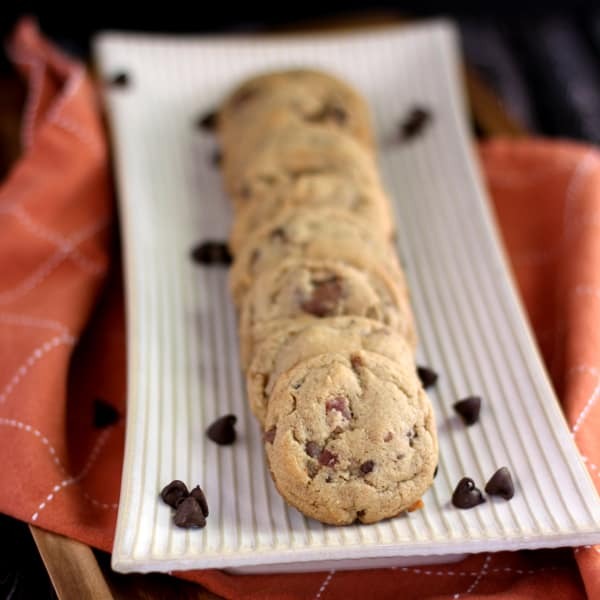 Peanut butter, peanut butter cups, chocolate chips and crumbled bacon all lend to the sweet and smoky flavor of these treats. Looking for a great treat for the guy in your life, especially with Father’s Day just around the corner? Something tells me these Double Peanut Butter Bacon Chocolate Chip Cookies will be a welcome site in the cookie jar! Granted, I did have to fess up to raiding my husband’s mini peanut butter cup stash after creating these. Working in my favor was the fact that this recipe creates four dozen cookies so he can simply enjoy them in cookie form until I buy him some more. Four dozen? YES! And I’m in and out of the kitchen in no time thanks to my Thanks to my beautiful, stainless steel gas range from GE. As I’ve mentioned previously with my Cake Mix Cookies recipe, the multi-rack convection feature allows me to bake two dozen cookies at once. Such a time saver! 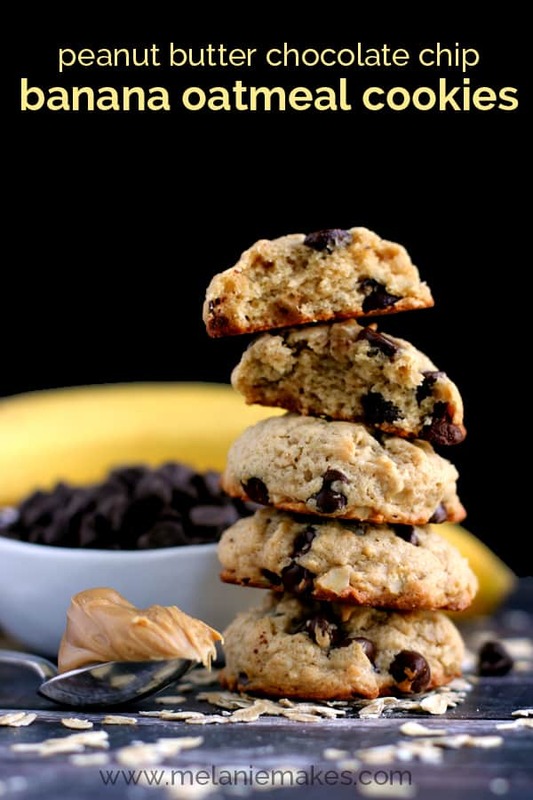 These soft and chewy cookies are absolutely loaded with flavor. 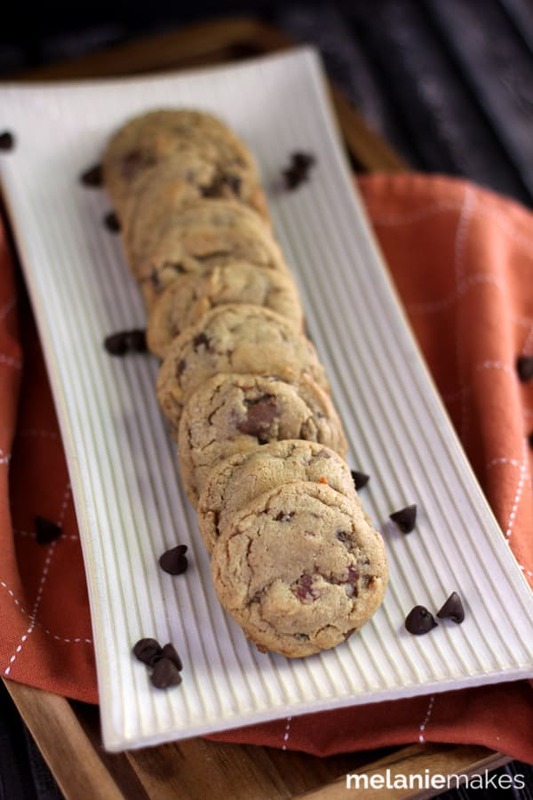 Peanut butter, peanut butter cups, chocolate chips and crumbled bacon all lend to the sweet and smoky flavor of these treats. I also chose to utilize bacon drippings to insure that without a doubt, you’d taste bacon in each and every bite. Mission accomplished! In the bowl of an electric mixer, cream together peanut butter, bacon drippings, shortening, sugar and brown sugar. Add eggs, hot water and vanilla and beat until fluffy. Mix in flour, salt and baking soda until just combined. 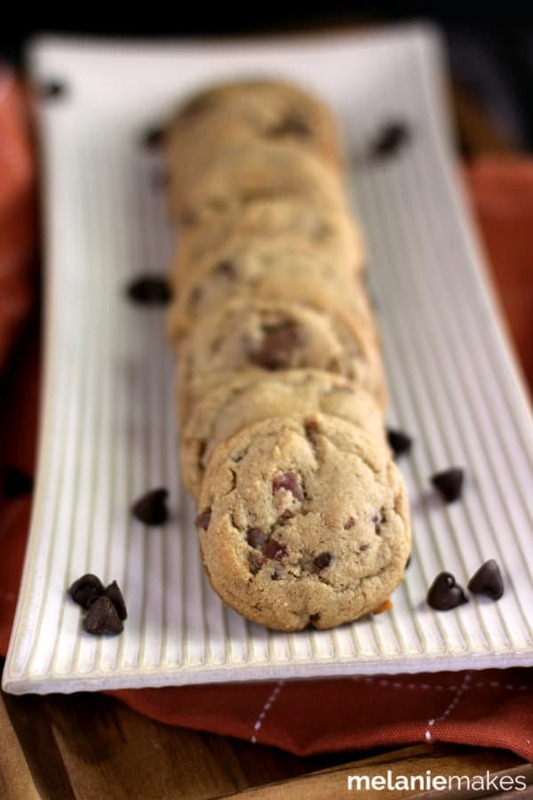 Stir in crumbled bacon, peanut butter cups and chocolate chips until just combined. 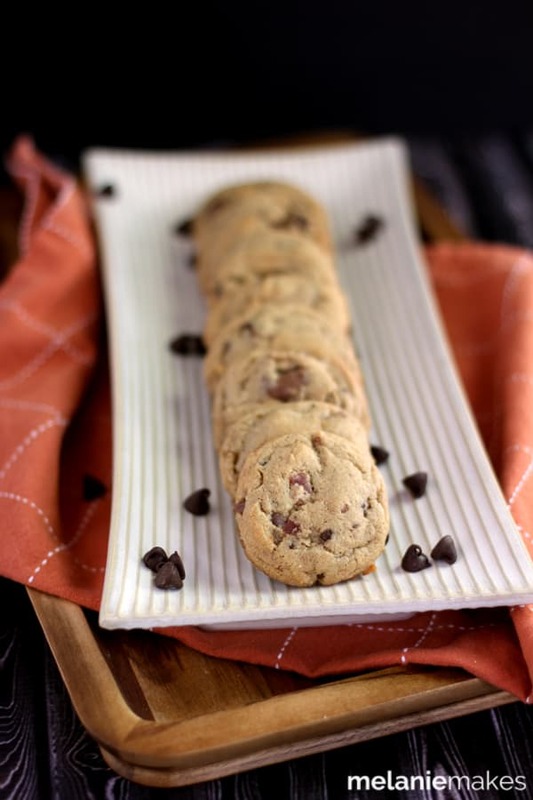 Using a medium cookie scoop , scoop dough onto parchment or silicone mat lined baking sheet. Bake for 10-12 minutes or until set and beginning to brown. Let cool for 5 minutes on baking sheet before removing to cooling rack to cool completely. If the bacon or bacon drippings you choose to use have a high salt content, you will want to adjust the amount of salt that you use in this recipe. So what do you say? How about surprising a guy in your life – or actually any of your favorite bacon loving someones! 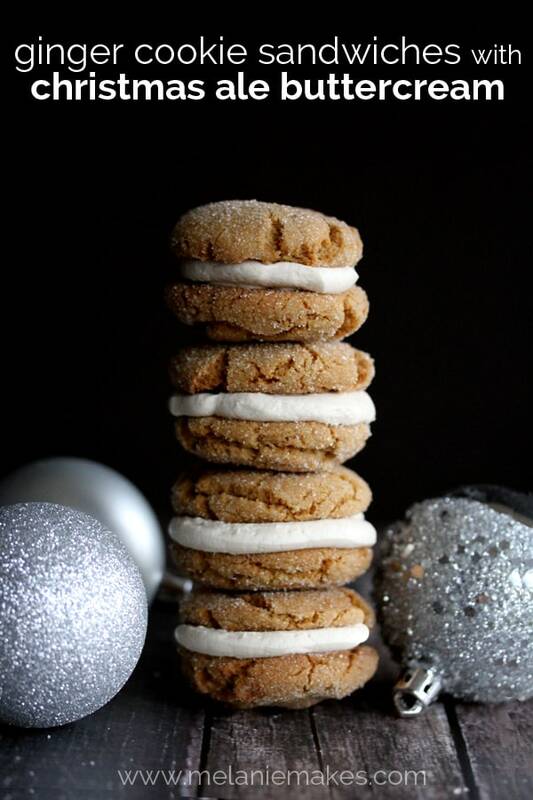 – with a dozen of these cookies sometime soon? Disclosure : I received this range free of charge from GE, however all thoughts and opinions, as always, are my own. Melanie, Damn, that is an excellent combination for a cookie! Would my spouse eat it? Who knows, he gets all weird about eating sweets--but my dad would sure love it! Is it wrong to want to marry a cookie? I'd say I am going to make these for my dad but I am pretty sure I will end up eating them all before I can make it to my parents' house! Pinning! Thanks so much, Dina - let me know if you give them a try! Melanie, these are awesome! Totally the perfect father's day cookie! Thanks, Elizabeth! 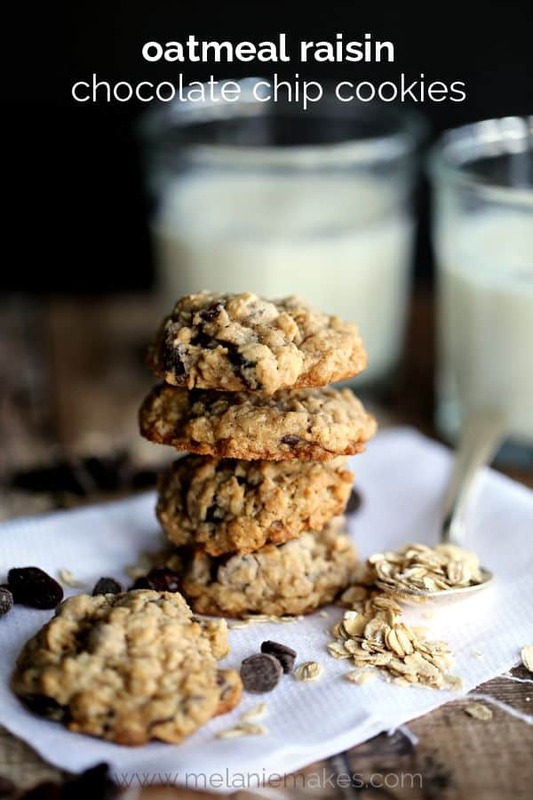 My husband thinks they're the perfect year-round cookie and they should be a mainstay in our cookie jar now. HA! Forget the guys I WANT these!!! Holy cow these are amazing!! I knew I liked you, Tanya! Thanks for the kind words. So amazing, LOVE the addition of crumbled bacon to these! Thanks so much, Matt - the smokiness from the bacon pairs so well with the chocolate! oooooh these cookies look DANGEROUUUS! So good! These cookies look amazing, Melanie! :) I always say that everything is a little better with some bacon added in! Pinned & sharing. That's exactly my husband's way of thinking as well, Carrie!